Heat up a mug of hot chocolate. 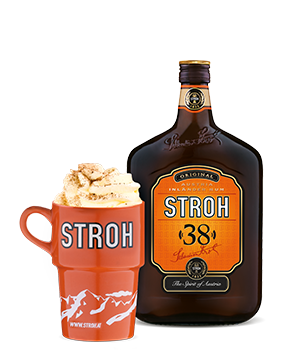 Add 3.5 cl of Stroh 38. Make it tastier still with a large spoonful of whipped cream and some chocolate shavings. A large spoonful of whipped cream and chocolate shavings. Mix with hot chocolate for a tasty drink. When it’s cold outdoors, bring the ambience of the warm Austrian Alpine huts indoors. Is the main ingredient of the famous Austrian Rumtopf, the top choice for a fruit punch ingredient. As it has a high alcohol percentage, Stroh 80 isn’t usually consumed neat, but is often used in cuisine or to flambé food. STROH 80 is even capable of burning an ice cube. Mix 1 part STROH Jagertee (‘Hunter’s Tea’) with 3 parts hot water and then simply enjoy this winter speciality. A party shot with a fruity taste explosion and a spicy aftertaste.